Find below the best city hotels list in Le Mans (France). Its provide by Booking.com the most popular Hotel booking sites with over 130 000 affiliate best hotel in the world. The Hôtel Normandie Le Mans is located a few metres from Le Mans? TGV station, close to the Palais des Congres. It offers free Wi-Fi internet access. 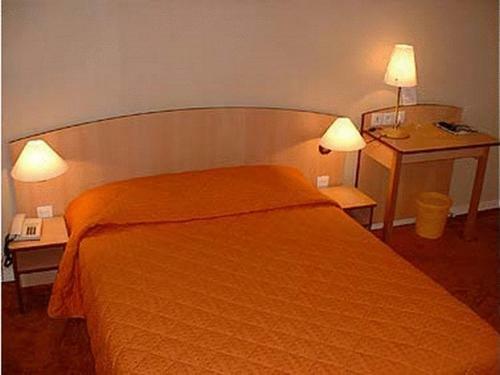 Hotel Chantecler is a friendly hotel located near the city centre of Le Mans. It offers free wired internet access and free parking. Rooms come fully equipped with satellite TV, telephone, bathroom. Some suites can accommodate up to 5 people. The Sporting Hotel is just a 2-minute walk from Le Mans TGV train station. It offers low-cost rooms with free Wi-Fi internet access. This economical hotel has a restaurant serving traditional cuisine and there is bar with satellite TV. The hotel is located in Le Mans, right next to the TGV Train Station. All Seasons offers Canal + satellite and free Wi-Fi in each guest room. Each room at the All Seasons has an en suite bathroom and air conditioning. Situated in the heart of Le Mans in the Loire region, the Commerce Hotel offers modern accommodation with TV and internet access. All the rooms have a separate bathroom, a work desk and a telephone. 19th century building turned into a hotel in 2006, Mercure Le Mans Centre is located in the city centre, only 500 metres away from Citée Plantagenet, the old city.